February 14 is a day to celebrate love and friendship. Whether you want to decorate your home or create something for a loved one, there are plenty of Valentine's Day crafts that express the sentiments of the holiday. These crafts make great gifts, or help to set the scene for a romantic Valentine's Day dinner. Making your own gifts adds a thoughtful touch to a holiday that is all about love and affection. Love coupons are a simple, quick gift that you can tailor to your recipient's individual preferences. You can make the coupons by hand or on the computer. Consider using blank business cards from the office supply store to print the coupons for a more professional look. Format the coupons in a text editor such as Microsoft Word and fill in your desired text. Alternatively, you can draw and fill out the coupons by hand using a pen or pencil. Print out the coupons and trim them so they are all the same size. Fold a piece of cardboard or cardstock around the coupons and trim to size to form a cover. Punch holes in the cover and coupons. Tie the cover and coupons together using the ribbon. Decorate the cover any way you like. 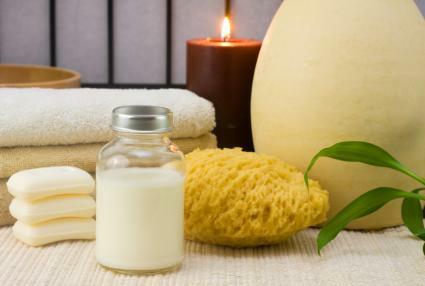 Create a fizzy bath scented with your favorite essential oils. Mix together the Epsom salt and baking soda. Add a tablespoon of glycerin and five to ten drops of food coloring. Mix well, so the color is distributed evenly. Add a few drops of your favorite essential oil. Put the mixture in a decorative glass jar with a tight-fitting lid. Add a tag instructing the recipient to use three to five tablespoons per bath. 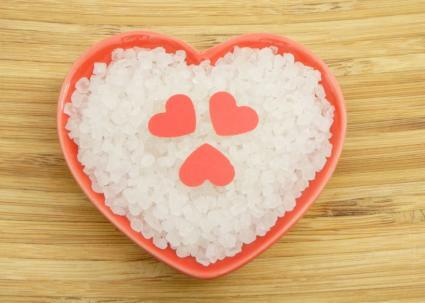 Present your loved one with both bath salts and a milk bath to have a spa day. Measure out two cups of powdered milk. Add two or three drops of your favorite essential oil. If desired, you could also add ¼ cup of oatmeal to soothe rough skin, a handful of your favorite dried herbs, ½ cup of Epsom salt or baking soda, and even a splash of olive oil. Mix everything together well, breaking up clumps with a fork or your hands. Use a cup or so in each bath, and remind the recipient to use a drain basket to catch any solid parts that you included in your recipe. This whimsical craft can be used to decorate any room of your home, and can be re-used year after year. Cut out 40 white hearts and 40 red hearts from the felt. Each heart should measure approximately 2-inches. Double up the hearts and blanket stitch around the edges with the contrasting color thread to create a two sided heart. String the hearts on twine to create a garland. Display this decorative candle and wreath on your coffee table and light it for a romantic evening. Glue sheets of decorative paper onto the card stock and allow to dry. 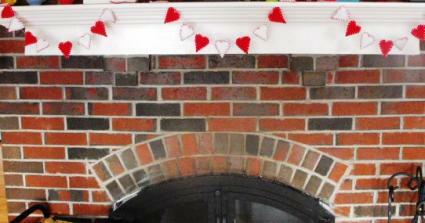 Cut out different sizes of hearts from the decorated stock. Punch holes in the center of each heart for the wire to pass through. String the hearts and beads onto the wire, twisting it into loops to create a wreath that will encompass the circumference of the candle. As always, never leave a lit candle unattended. 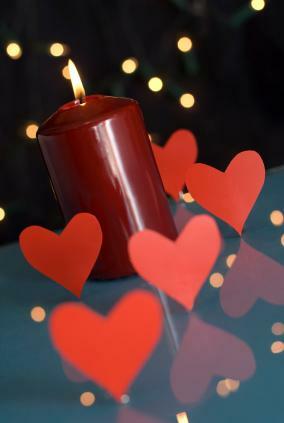 Make sure that any paper hearts on your wreath are a safe distance from the candle flame. Use any of these craft ideas to inspire you to add your own personal touches. While following instructions is a necessity, use your creativity and imagination to turn basic Valentine's Day craft projects into something truly special. Create any of these crafts from your heart and enjoy the creative process.